For patients facing the uncertainty of a breast cancer diagnosis, Greenwich Hospital’s Breast Center offers world-class care close to home. The Center delivers first-rate, compassionate care recognized by national ranking and accreditation organizations and patients alike. 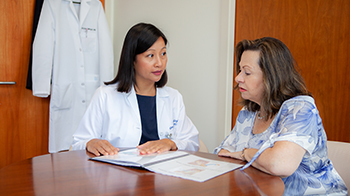 The National Accreditation Program for Breast Centers (NAPBC,) a quality program of the American College of Surgeons (ACS) granted its seal of approval – three-year accreditation – to the Breast Center at Greenwich Hospital. To achieve voluntary NAPBC accreditation, a breast center demonstrates compliance with 28 NAPBC standards that look at a center’s leadership, clinical services, research, community outreach, professional education, and quality improvement. Breast centers seeking NAPBC accreditation undergo a site visit every three years. The Breast Center at Greenwich Hospital is committed to maintaining levels of excellence in the delivery of comprehensive, patient-centered, multidisciplinary care resulting in high-quality care for patients with breast disease. Patients receiving care at an NAPBC-accredited center have access to information on clinical trials and new treatments, genetic counseling, and patient centered services including psycho-social support, and a survivorship care plan that documents the care each patient receives and seeks to improve cancer survivor’s quality of life. For the sixth consecutive year, Greenwich Hospital has also received the 2019 Women’s Choice Award as one of America’s Best Breast Centers.